Join Judy Wise and me for a beautiful weekend of dyeing with blue indigo September 11-13 in Gig Harbor. 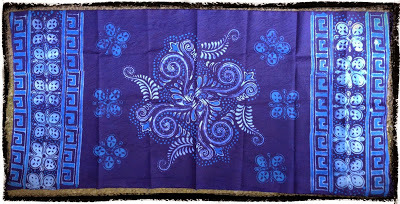 Years ago, Judy was a batik artist and silk dye painter. She also studied yuzen dyeing in Japan. We will learn how to make a dye pot, that scrumptious bucket of indigo, that will transform fabric to be used in a myriad of creations. Tying, folding, scrunching, we will create designs in our fabric as well as bags, and paper, with no two creations turning out the same. We'll use some of this fabric to build a book like the one below made by Judy. I'll be dyeing some of my rusted papers like the ones below. Update: This workshop is full. The class will be limited to 10 students. There are many beautiful B&B's available in Gig Harbor as well as a Best Western and the Inn at Gig Harbor. Here is a link for more information. If interested, please use the contact form below to sign up.